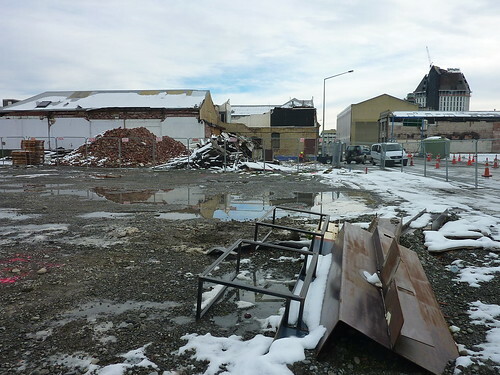 We'd arrived late the previous night and Christchurch was a mass of snow and ice. It was freezing. We got a cab to Canterbury House from the airport, staggered into the room which had a heater that was struggling against the cold - our breath was clearly visible - and collapsed into sleep. Our host Alan (who bears more than a passing resemblance to Martin Sheen) and his wife Keiko really looked after us the next day. In the morning, as we'd obviously not been able to get any food the previous day, Alan provided us with bread for toast as well as assorted jam, butter, milk, etc for a decent breakfast. He gave us numbers for various rental companies, ensured we had enough wi-fi credit to get online, and pointed out the various supermarkets in the area. We were ready to go at about 10am. Oddly, it was cooler inside the building than outside - the sun was blazing which took a lot of the sting out of the otherwise low temperature. I stepped outside and immediately went back inside to dump my fleece and hat. I thought there was no point getting too warm in that kind of weather as I'd only end up feeling even colder when we actually got into the serious freeze, and wouldn't appreciate the extra layers. 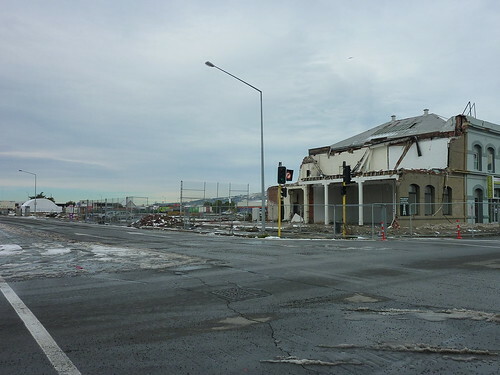 The aftermath of the 2011 earthquake is apparent all over Christchurch. There is a huge red zone around the centre which is probably a good two square kilometres, and it's off-limits to the public. This includes the museum and art gallery: the two main attractions in the town, the latter of which was lauded before the event occurred. Hundreds of businesses were ruined, thousands of people lost everything, but somehow not a single person was killed. This is in comparison to the Japanese earthquake (7.2 on the Richter Scale) from 1995 in which over 6400 people died. 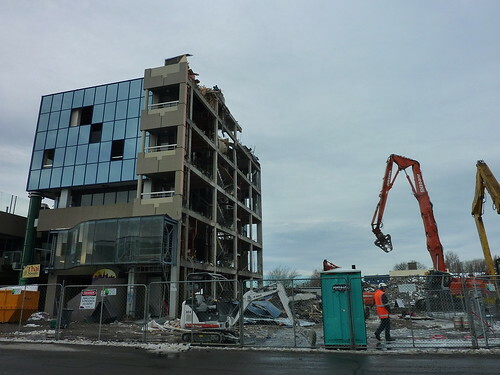 A minor miracle in Christchurch. Even so, the rebuild is likely to take a decade. 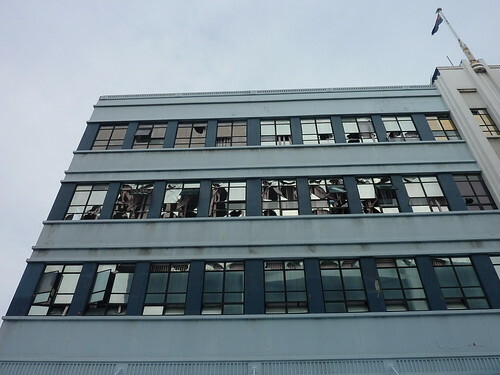 Two years on, and it has barely been touched - the majority of buildings in the centre which are still standing will need to all be pulled down, as the foundations have been weakened. Insurance companies are still arguing amongst themselves and the government too, which will no doubt lengthen the process. Fortunately, one of the buildings still standing was the library so we were able to do some research on rental companies, sort out bank stuff and research ski resorts. Gilly had been wanting to go skiing for years. I've not really been keen. If you imagine what I'm like on a bicycle- that is to say, not good - strapping me to a pair of thin planks and chucking me down a hill makes my bike-riding ability look comparatively masterful. I've skied once in my life, on a dry ski slope somewhere in Shropshire. I was about 7. I remember it being cold, I fell over a lot, and I had jeans which had metal buckles on the end of the legs for some reason which were very, very painful in my ski boots. 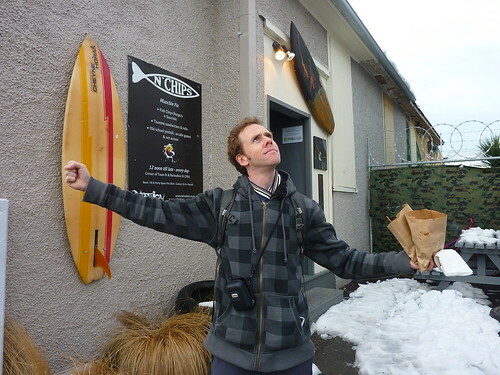 Skiing in New Zealand should hopefully be different, firstly because there is actual snow here, and secondly because we'll be getting some beginner training and have decent equipment. We wandered around the outside of the red area, before heading up to a supermarket to pick up food for dinner. 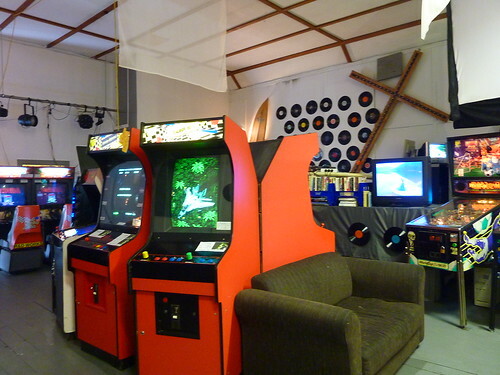 On the way, we came across a fish and chip place called Munchie Fix housed in an art house building called Kreation, which had a room full of retro arcade cabinets. Bomb Jack, Galaga, Street Fighter, Metal Slug...there were some classics ready and waiting for your dollar coins. 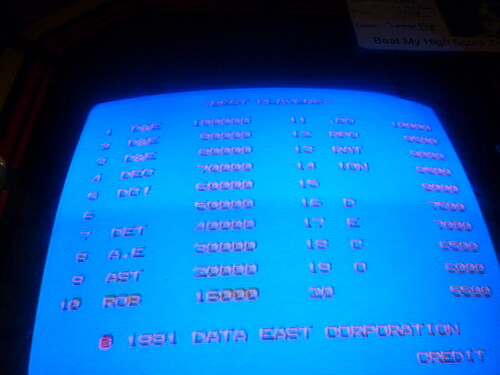 Better still, on each game cabinet was a piece of paper with a high score (no doubt scored by a previous player or a staff member) - if you beat the score, you won a prize. For Pac-Man, it was fish and chips. For Bomb Jack it was a pie, and so on. My eyes lighted on a game called Tumblepop with a high score of 11,600 to beat. 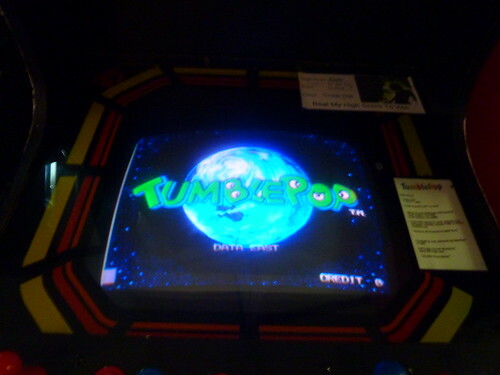 I played Tumblepop in a pier arcade in Canada in 1992, a year after it was released; 20 years on, it's looking pretty dated but still great fun. After finding the supermarket and stocking up, we dropped it all off at Canterbury House then went in search of an ATM. We found one at a BP garage, and it promptly broke as soon as I asked to take money out. I didn't take it personally. We then went in search of another, and after 30 minutes of wandering around and taking directions we finally found one next to a pub called The Brewer's Arms. They had a sign outside saying "warm fire", so we thought it'd be rude not to partake, especially as the temperature was rapidly dropping. A pint of scrumpy cider later, and we were definitely feeling a little warmer - 8.2%, and not bad, even if the barman did describe it as "like drinking petrol". Living in Bristol for 8 years makes your body hardened to cider. Taking 6 months off it though...it doesn't like that. One pint was plenty, thanks. We found our way back, chucked a pizza in the oven, had some wine and watched a couple of TV shows. The next morning we were up early to get a shuttle bus to the Britz office. We'd decided to go with them because they a) had decent vans b) had a decent price c) had decent customer service and d) chucked in snow chains and a free heater just for asking. After the Apollo debacle, anything with "Hippie" "CheapaCampa" or "Apollo" was off the table, as was "Real Value Campers" - yet another subsidiary company associated with them. We were desperately hoping nothing would happen to the van on the road; our credit cards were maxed out simply covering the bond for the 29 days we're hiring them for, mainly because Apollo hadn't yet refunded our bond for the hire period on the Great Ocean Road. It can take up to 14 days to get it back, apparently. On the West Coast, Britz gave us ours back in under 5 days. Another reason to avoid Apollo. We collected the van and I chanced my arm and asked for another duvet, which they were happy to provide with no charge or question. I guess business is a little slow at present - the ski fields have only just started to open, and even that is due to the unseasonable weather. The driver who brought us from the airport said she had only seen it snow in Christchurch on 6 occasions in her lifetime, and she must have been in her mid-30s. We also had the dubious honour of missing our flight due to "the coldest day in Christchurch on record". That may have accounted for the raft of snow which was dumped on the town. According to that same driver, the airport was actually open on the 6th but it was the airlines' choice whether to fly or not. Jetstar obviously chose not to. The van was a Volkswagen Transporter, which was a little different to the Hiace we took from Melbourne, and more like the one we had on the West Coast. No bad thing. We set off for Methven, a town which was transformed by the skiing industry and now sees floods of tourists arrive around June/July, ready to hit the slopes. En route we stopped for food at PakNSave (the equivalent of Coles in NZ), picked up another hoodie each, grabbed a knee support for my left leg (it's been dislocated twice, and I'm not sure skiing will be too good for it if left unsupported) then had a fantastic lunch at Kinara Indian. Jeera chicken and chicken biryani with rice and naan, all for £10. Superb. We were certainly enjoying the conversion rate here a lot more than Australia. We arrived at the visitor centre in Methven and got booked in for a beginner ski pack the following day which included a lift pass, poles, skis and boots as well as two 1.5 hour lessons for $120 per person. Jacket and trousers are another $39 on top, and the bus to the slopes is $18. All told, it was around £94 per person for a day's skiing, including instruction - pretty reasonable. We thought that if we enjoyed it, we may stay another day or perhaps do some more in a week or two in Queenstown. I figured that it would take me a few days to learn not to thrash about before comically falling over, comically dislocating my knee and being comically airlifted to hospital. We ended the evening in Abisko Campgrounds and powered up the van. With the heater on and with two duvets and some blankets on top for good measure, we were pretty warm. Getting out of bed the next morning for a 7:45am pickup to the snow fields was going to take a bit of effort. Still going strong I see. Keep it up!